The Delta team met with Mike Holmes and his team earlier this season to look at remediation and cleanup options for the Fort McMurray AB wildfire. Delta’s Bio Remediation technology could be used to clean up residual oil spills, diesel spills, or other hydrocarbon spills that were the result of the fire, and concrete foundations could be recycled using Delta’s concrete recycling process. 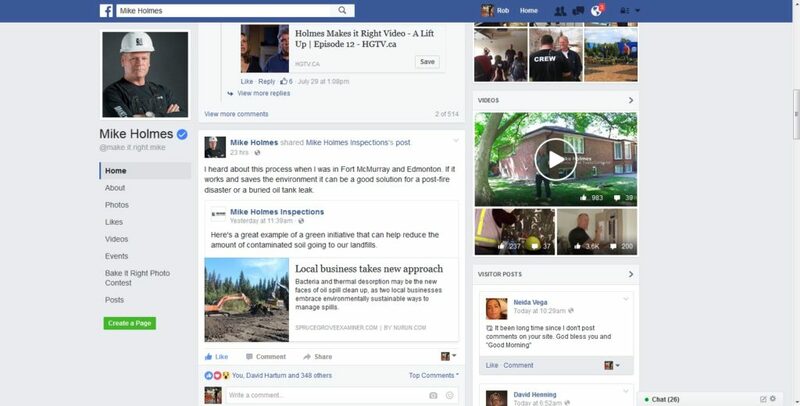 After we shared a recent newspaper article on Delta Remediation with Mike Holmes, he decided to share it on his facebook page. The post quickly went viral, and after receiving more than 50,000 hits on the Delta Remediation post in 24 hours Mr. Holmes knew that Delta’s oil eating Bacteria was definitely something that people take note of. Thanks for the share Mike Holmes and keep on Making it Right !